How to Easily Master Format HUAWEI ASCEND W1 with Safety Hard Reset? Solutions and Tips for HUAWEI ASCEND W1. For user who would like to use Microsoft Windows Phone 8 smartphone, can be choose HUAWEI ASCEND W1, the price is good with the specifications. The HUAWEI ASCEND W1 have 4 inches LCD screen and also available with multitouch for same operating depend on the applications. How to Fix or Problem Solving for Recovery HUAWEI ASCEND W1 hang or not responding or malfunctions or stuck or freezing or bricked ? Microsoft build Windows Phone 8 operating system with almost without problem. With the 512 MB RAM, we can run almost all applications at HUAWEI ASCEND W1 without lag. We can download more applications from Windows Market Place. But some user maybe ever get problem with the HUAWEI ASCEND W1 like hang or stuck or bricks or frozen or LCD touch screen not responding. In this case this problem maybe happen because we get applications problem or wrong setting or something like that. Please try doing soft reset or restart or reboot HUAWEI ASCEND W1 to delete some cache and temporary files. If the HUAWEI ASCEND W1 still get problem, then we have to do hard reset with master format. How to Soft Reset or Reboot or Restart HUAWEI ASCEND W1 ? To soft reset or restart or reboot HUAWEI ASCEND W1, we can do with unplug or remove the battery from the place, wait about 3 second or more, then plug the battery again in the positions. This step will finish the soft reset or reboot step. There are also another step to restart by pressing Power Button for several second, and then the LCD will show something with ‘slide down to power of’. Slide the LCD down, then it will turn off. 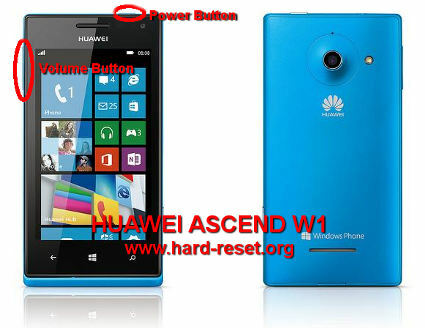 You need to press Power button again to turn HUAWEI ASCEND W1 on again. The the HUAWEI ASCEND W1 will do the hard reset format, wait about three until five minutes. While waiting you will see the gear appear until it finish. How to Restore and Reinstall Clean Windows Phone 8 operating system / firmware at HUAWEI ASCEND W1 ? HUAWEI ASCEND W1 have Microsoft Windows Phone 8 operating system by default. In some case maybe we need to reinstall or restore the factory setting or clean Microsoft Windows Phone 8 operating system or firmware at HUAWEI ASCEND W1. As we know that the clean default operating system of HUAWEI ASCEND W1 already saved inside this smartphone ROM, so we do not need to copy from other source or outside the HUAWEI ASCEND W1. By doing simple step of hard reset above, then the clean and factory default HUAWEI ASCEND W1 Micorosft Windows 8 operating system will be reinstall by itself. How to Unlock or Fix or Bypass or Solutions for HUAWEI ASCEND W1 forgot password code or security lock screen pattern or pin (lost password)? We can give a security protection or lock screen at our HUAWEI ASCEND W1. But how to bypass it if we forget the security password protection? If we forget the answer, then we do not have other option except to reinstall or hard reset HUAWEI ASCEND W1. How to Improve Performance HUAWEI ASCEND W1 to make run more faster? Microsoft Windows Phone 8 is running smoothly at HUAWEI ASCEND W1, but some user have slowly experience after use several months. There are several causes which can make the HUAWEI ASCEND W1 become slowly. To make HUAWEI ASCEND W1 back to faster again, please try to uninstall several applications. Or do the hard reset or master format HUAWEI ASCEND W1, so the performance will back to faster like new. What is the Secret Code Key for Hard Reset HUAWEI ASCEND W1 ? There is no secret code for doing hard reset or master format HUAWEI ASCEND W1. Just follow the step above to hard reset is the easy way to do. How to Upgrade HUAWEI ASCEND W1 to Microsoft Windows Amber or GDR2 Update Operating System ? If the update ready for this smartphone, then we can download and follow the step, but the HUAWEI ASCEND W1 will give suggestion to use Wifi internet connection to download the update. [A] Hi, the Huawei Ascend W1 get official update for Windows Phone GDR2 using OTA (Over The Air) update. Because it use OTA update, mean the Huawei Ascend W1 should use internet connection to download and update the Windows Phone GDR2 operating system update. But he have to know, usually OTA update will not update together for all country or region. This method will requires some update OS version gradually. The update have to do separate time for each region or country. You should make sure your country also get officially upgrade for Windows Phone GDR2 with OTA steps. Some countries get update faster date while other countries will get at different later time. [Q] I am following the hard reset steps but the axclamination mark doesn't appers! [A] Hi, please try to do carefully. You should try again from Big Step One (A) and continue with Big Step One (B) and follow the other step by sequence to do hard reset your Huawei Ascend W1 Windows Phone. The information from this page describe about huawei w1-u00 hard reset,hard reset huawei w1,hard reset huawei w1 u34,huawei w1 hard reset,hard reset huawei w1-u00,how to hard reset huawei w1-u00,hard reset huawei w1-u34. If you need another resource for hard reset, use search function at this homepage or find from our related posts. How to Easily Master Format XIAOMI MI3 with Safety Hard Reset? How to Easily Master Format ACER LIQUID X1 with Safety Hard Reset? How to Easily Master Format NOKIA LUMIA 525 with Safety Hard Reset ? I am following the hard reset steps but the axclamination mark doesn’t appers! Hi, please try to do carefully. You should try again from Big Step One (A) and continue with Big Step One (B) and follow the other step by sequence to do hard reset your Huawei Ascend W1 Windows Phone. Hi, the Huawei Ascend W1 get official update for Windows Phone GDR2 using OTA (Over The Air) update. Because it use OTA update, mean the Huawei Ascend W1 should use internet connection to download and update the Windows Phone GDR2 operating system update. But he have to know, usually OTA update will not update together for all country or region. This method will requires some update OS version gradually. The update have to do separate time for each region or country. You should make sure your country also get officially upgrade for Windows Phone GDR2 with OTA steps. Some countries get update faster date while other countries will get at different later time.